Infront Sports & Media, a Wanda Sports company, in partnership with Velon, the business venture aiming at bringing cycling closer to the fans, has announced the growth of the pro cycling Hammer Series in 2018 with a second event location in Stavanger, Norway. The introduction of Hammer Stavanger will mean that the sixth edition of the Tour des Fjords next May will now be three stages, following the new three-day Hammer Series format. The Tour des Fjords partnership with Velon secures an ‘unprecedented high-class field for both events’. Sixteen of the best cycling teams from around the world are competing at Hammer Sportzone Limburg this weekend. Spanning three race days, the teams will compete in the Hammer Climb, Hammer Sprint and conclude with the Hammer Chase race. The series features an innovative race format, which is designed to deliver cycling action that is fast, exciting, accessible and easy to follow for spectators and fans. Infront and Velon note that a market-orientated format encourages engagement with the local community at each race destination through various levels of activities that will be beneficial for the host cities, the media, the fans and the cyclists competing. To deliver maximum excitement, the professional race in Limburg is complemented by a cycling festival, which will provide fans on site with a variety of activities including mass participation races, a youth race, a fan village, a cycling expo, team bus parades and further entertainment features. Taking a ‘digital first’ approach, all the action from the event will be streamed live to reach as many people worldwide as possible to introduce them to the format and to excite them about professional cycling. On Facebook, a live stream will be available on the Hammer Series’ Facebook page – www.facebook.com/hammerseries and the Sports on Facebook page – www.facebook.com/sportsonfb. In addition, the live stream on YouTube will be available on the GCN channel – www.youtube.com/GCN. The 12-time Tour de France stage winner Robbie McEwen, will be fronting the coverage incorporating his knowledge of pro cycling combined with Velon’s real-time rider data to provide stats to accompany the race action for fans. This approach underlines the ambition to make the events accessible to everyone and connect fans worldwide. In addition, Infront has distributed media rights across traditional media platforms. 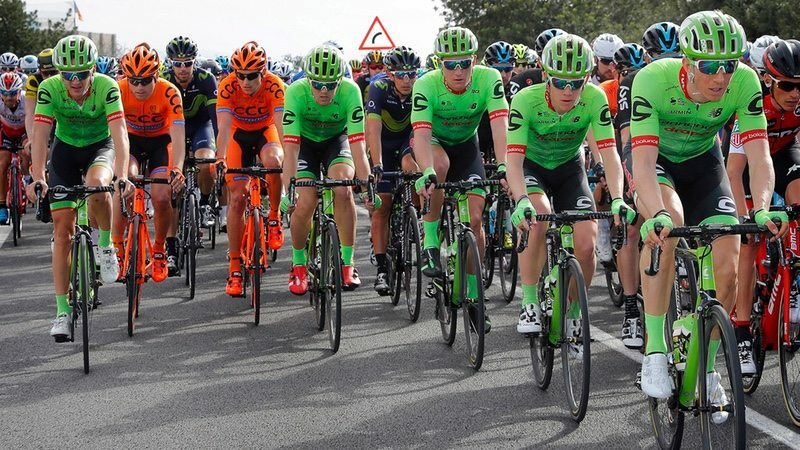 Key agreements secured in well-established cycling markets include: Belgium (Eleven Sports Network), Denmark (TV2), UK and Italy (Bike Channel), the Netherlands (NOS and L1) and Pan-Europe through ithe popular sports channels Eurosport 2 and Player. This is complemented by broadcast agreements for growing cycling markets in China, Hong Kong and Japan. Media production for the event in Limburg is being handled by Infront subsidiary HBS. Live on-board and in-car cameras and real-time performance data transmission produced by Velon will be made available to international TV broadcasters with live on-screen race data included in the main feed (speed, power, cadence and heart rate). A number of leading household brands have committed to the event in Limburg. Sponsors include Heineken through its brand Amstel (beer), MINI (car manufacturer), DSM (life and materials science company) and Boels (equipment rental company). Each of the brands will benefit from prominent branding on advertising boards and inflatables along the course and a comprehensive hospitality contingent at each of the race days. Stephan Herth, Executive Director Summer Sports at Infront said “We are continuously investing in the development of sport – by developing new event formats or enhancing existing properties. We fully believe in this revolutionary new event format and are beyond excited for the launch this weekend. We are confident that we will see a successful event that encourages engagement across the board from the cyclists to the fans.